Welcome to the Institute of Molecular Evolution at Heinrich-Heine-Universität Düsseldorf. Our main scientific interests are endosymbiosis, early evolution, the origin of life, cell evolution, genome evolution and compartmentalized energy metabolism with emphasis on chloroplasts, mitochondria, and hydrogenosomes. 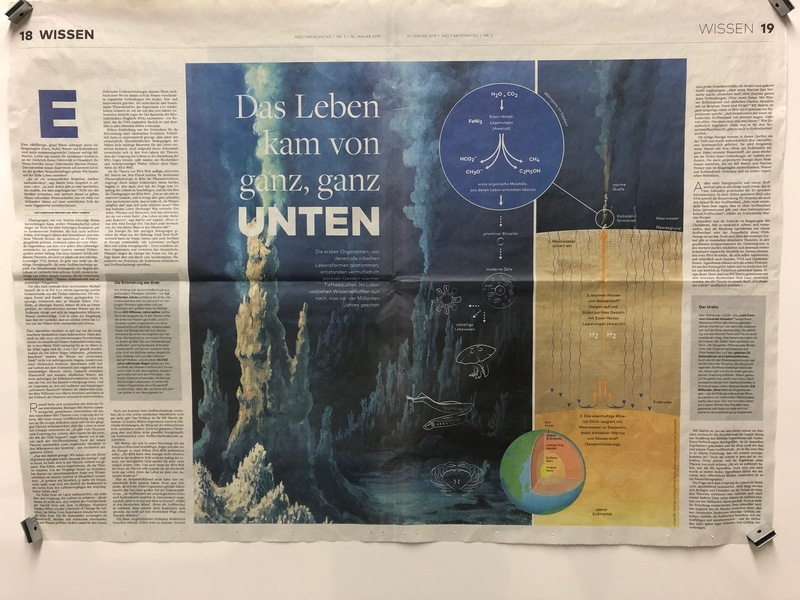 Welt am Sonntag (German for World on Sunday), a German Sunday newspaper, published an article about Bill Martin and his research on the origin of life. Members of the Institute of Molecular Evolution and pupils from Düsseldorf are on Elba to analyze the effects of plastic contamination on the marine environment. The project is supported by the HHU initiative "Bürgeruniversität in der Lehre" and documentated in a blog. William Martin took part in the Roundtable Discussion "The Archaea-Eukaryote evolutionary pathway – Is the roadmap clear?" at the 17th International Symposium on Microbial Ecology in Leipzig, Germany. The Roundtable Discussion was organized by Chuanlun Zhang (Southern University of Science and Technology, China), Ruixin Zhu (Tongji University, China) and Li Huang (Chinese Academy of Sciences, China). Com'era fatto il primo organismo mai vissuto sulla Terra? The Archbishop of Berlin, Dr. Heiner Koch, held the laudatio to the laureate, Prof. William Martin, at the award ceremony of the Klüh Prize in the Hotel Adlon (Berlin). Dr. Koch's laudatio and Prof. Martin's acceptance speech are available on the website of the Archdiocese of Berlin (in German). 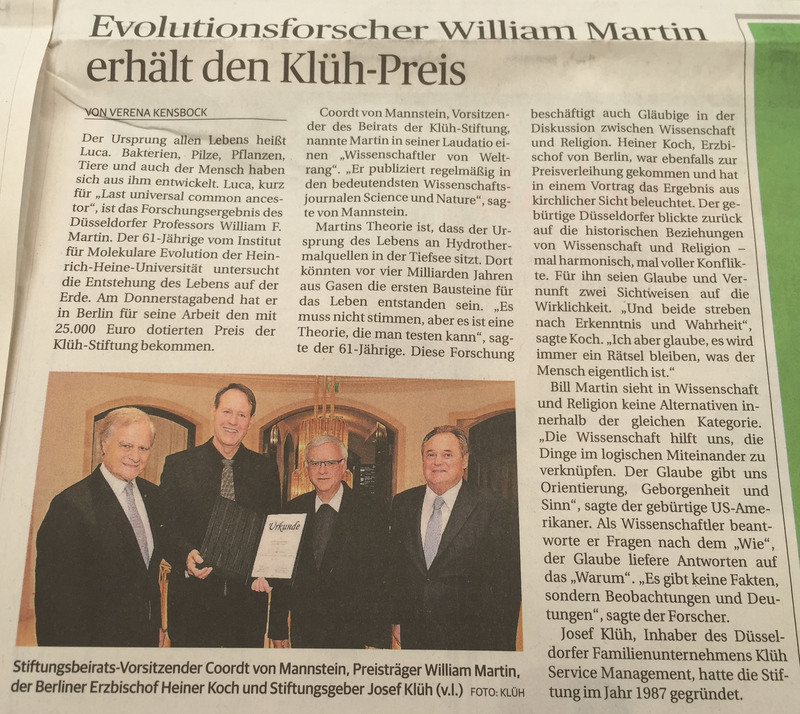 Rheinische Post, a major German regional daily newspaper, published an article about William Martin and the Klüh Prize 2018 awarded to him. Westdeutsche Zeitung, one of the largest German regional daily newspaper in North Rhine-Westphalia, published an article about William Martin and the Klüh Prize 2018 awarded to him. "Plastid longevity in sacoglossan sea slugs". Ursprünge des Lebens. Wo lebten die ersten Zellen, und wovon? William Martin recieves the 2017 Spiridion Brusina Medal of the Croatian Society of Natural Sciences. "Eisen: Warum wir es zum Überleben brauchen"
The VolkswagenStiftung will support Prof. Dr. William F. Martin in the next five years under the initiative "Life – A fresh scientific approach to the basic principles of life". This project is in cooperation with Prof. Dr. Martin Lercher (HHU Düsseldorf) and Prof. Dr. Eörs Sathmáry (Parmenides Institute Munich). Project title: "A unified model of recombination in life"
William Martin reported on WDR 5, a radio channel produced by the Westdeutscher Rundfunk (WDR), a public broadcasting company in Germany, in the program "Zeitzeichen" about Stanley Miller on the occasion of the 10th anniversary of Miller's death. Google Scholar lists public profiles for Heinrich-Heine-Universität Düsseldorf. "Mitochondria and Major Transitions at the Origin of Eukaryotes". Chuan Ku was awarded for the Best Doctoral Dissertation 2016 of the Faculty of Mathematics and Natural Sciences at Heinrich-Heine-University Düsseldorf. "Cytoskelett-Analyse parabasalischer Parasiten: Die Präsenz potentieller Intermediärfilament Proteine in Protisten".